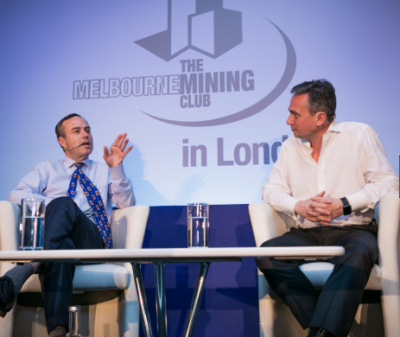 The Melbourne Mining Club is a not-for-profit organisation formed to promote the minerals industry and offer a networking forum where the biggest names in industry can meet. From acorns, big trees grow. The Melbourne Mining Club’s commitment to the resources sector is highlighted in our Cutting Edge events which provide a forum for small-to mid-cap exploration and development companies to showcase their activities, management and business strategies in an informal gathering on a Tuesday afternoon, starting at 5.30 pm, at the Melbourne Town Hall. The highly distinctive Melbourne Mining Club logo can now be seen in many resource industry capitals around the world. Our first event outside Australia was to the heart of the global mining investment world, the City of London, and we are now in our 10th year of events in The Old Dart. The Melbourne Mining Club is delighted to be sponsored by AMC Consultants and White & Case. Melbourne Mining Club and the Djakarta Mining Club have joined forces to build stronger relations between the resource industries of the regions two biggest mining sectors. Djakarta Mining Club Co –Founder and Vice Chairman Mr David Duffy offers MMC members reciprocal membership of the Djakarta Mining Club to attend Djakarta Mining Club events at the member attendance price. The Djakarta Mining Club has 2,200 members from 900 companies and 25 sponsors. In recent years, the MMC has had regular contact and we look forward to working together in the future. DMC members are cordially invited to attend MMC functions – the bi-monthly luncheons and the Cutting Edge afternoon events – by registering on the website . We look forward to posting photos of DMC members on our gallery page, a popular site for our members. Welcome to 2019 and another big year for the Melbourne Mining Club. We will start the year with a keynote address by Shell Australia Chair, Zoe Yujnovich, at the magnificent Melbourne Town Hall on Wednesday 13 February. But what a year we had in 2018. My 2018 highlight had to be the success of IMARC – the International Mining and Resources Conference in late October. IMARC is a Foundation Member of our Club, and I have been a big believer in the concept of Melbourne, as the hub of the Australian mining sector, hosting an internationally-recognised major mining conference. IMARC 2018 exceeded our wildest dreams in terms of speakers and attendances, and we hope for another successful IMARC this October. Orica chief, Alberto Calderon, started our MMC year off with a bang, using his speech to scope out a way for Australia to counter the Trump corporate tax cuts move. The proposal for faster write-offs of capital investment became known as the Calderon Plan in the media and generated much discussion. In April, we were given a vision of the new age of battery power when Ken Brinsden, chief of lithium exporter, Pilbara Minerals, crossed the Nullarbor to address our members. South Australia’s expansion-focussed copper miner, Oz Minerals, grabbed centre stage as MD Andrew Cole spoke passionately about the future of mining in Australia at our June luncheon. Our London dinner on 28 June featured an insightful and fun-filled keynote interview between Rio Tinto CEO J-S Jacques and FT Editor Lionel Barber (pictured below) at Lord’s Nursery Pavilion. Legendary England captain, Mike Gatting, welcomed the MMC to Lord’s, and our 550 members and guests had a night to remember, with our Event Partner being the ANZ Bank, represented by their resources chief Aaron Ross. Our August event was not to be missed as Tony Makuch, CEO of Kirkland Lake Gold, introduced himself and the company to our members. KL Gold’s Fosterville mine, near Bendigo, is one of the richest gold mines in the world and a major showcase for the re-emerging Victorian gold sector. Energy supply and distribution was front and centre in November as Woodside CEO Peter Coleman addressed the Club, while we topped off the year with a keynote from Federal Resources Minister Matt Canavan. The Cutting Edge series grew in popularity in 2018 and I am confident that a graduate from the CE will front the big stage in 2019. Special thanks to our event sponsors PwC, the Victorian Government and Mincore Engineers. Check out our website for the complete list of Cutting Edge presenters. Attendances remained strong at our luncheons with 3,200 members and guests attending the six events. Support for the Cutting Edge was strong, with registrations averaging 225 at each of the five events. Your Club was able to allocate a total of $25,000 in surplus funds to educational causes supported by the AusIMM and the MCA. These funds were applied to professional development of mining students and to educational programs with teachers. The Club welcomes a new Principal Sponsor for 2019 as global law firm, White & Case, has stepped up to join our great friends AMC Consultants. We say a sad farewell to Swann Global which has been with us since inception in 2001. The Club also welcomes back Melbourne-based leading gold producer St Barbara as a Foundation Member and Mets Ignited as the sponsor of our ‘Future of Mining’ student initiative. The MMC Steering Committee is a hard-working group of volunteers – we welcome Newcrest executive Rebecca Irwin and veteran journalist and China-watcher Rowan Callick to the team. We farewell Sally Cox of BASF to a posting in Hong Kong, and she will transfer to our International Advisory Board. There’s heaps more about the Club at our website including photo galleries from our many events. Follow us on LinkedIn and Twitter, and if you are not a member, sign up at the web page. It’s free! Wishing all our members, supporters and sponsors (including our very supportive JV partners at the Minerals Council of Australia and the AusIMM) a prosperous 2019. 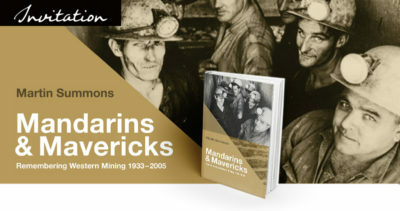 Remembering Western Mining 1933-2005, to purchase your copy click on the link below.